After a friend of the portly aristocrat Lord Mortimer (Billy House) dies in an attempted escape from Bedlam. In order to appease the angered aristocrat, Master George Sims (Boris Karloff) throws a party for Lord Mortimer and his friends at the asylum with the inmates as entertainment. Ours is a human world. Theirs is a bestial world, with reason, or soul. Some are pigs, those I let wallow in their own filth. They’re animals. Some are dogs, these I beat. Some are are tigers, these I cage. Nell Bowen: I’ve seen enough! When the inmate known only as the Gilded Boy collapses while performing, Lord Mortimer’s spirited protege Nell Bowen (Anna Lee) decides to fight for the inmates’ rights. While Nell seeks the help from the law, Lord Mortimer and Master George Sims have arranged to have Nell locked up in bedlam herself. Now she must find a way to help the inmates from the inside, without becoming a madwoman herself. This film is a look back into the past, peppered with political correctness, and feminism. Bedlam is confused about what type of film it is. It starts off a mystery, turns into politics, then to human fear, romance, and horror. The atmosphere of Bedlam overall was well done. The asylum was horrifying, and frightening, when in contrast Lord Mortimer’s home was decadent and comfortable. The costumes were chosen well and fit the time period beautifully. The story was interesting, but not executed in the best way possible. Nell Bowen doesn’t have much of a personality in the film. All we know about her is that she is kindhearted, and a feminist. Master George Sims, on the other hand, is a breath of fresh air in this movie full of cliches. Boris Karloff shines as George Sims giving him terrifying moments of tenderness, mixed masterfully with serene acts of horrifying violence. What separates great characters like Master George Sims from the rather bland Nell Bowen is that he is that he is more than the role he is given. He is evil, he is deplorable, he is disgusting … But he has his own goals apart from earning pennies from showing madmen sitting in their filth. Bedlam is a mere stepping stone for him into high society. Nell Bowen’s characterization is defined by what she isn’t. n’t like everyone else, she isn’t indifferent, but the the film never tells us who she is. When we first meet her in the movie her long term goals are sketchy at best. By the end the film her transformation is unrealistic. Overall Bedlam is a visually appealing movie. The story had potential, but most of the characters were bland. The film is enjoyable mainly because of Boris Karloff’s performance. 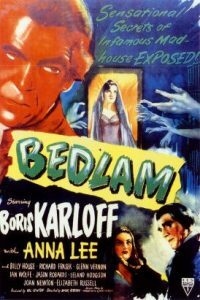 So if you are a fan of Boris Karloff, or of the producer Val Lewton’s films like Cat People I would recommend Bedlam. I would rate this film 3 out of 5 stars.